Microsoft's Exchange email system is the corporate de-facto standard. The Outlook integration is wonderful and Outlook 2007 provides many benefits when used with Exchange 2007. Exchange 2007 provides Outlook Web Access which provides web based access and mimics the desktop Outlook, albeit with less functionality. Mobile device access with ActiveSync push email (Windows Mobile, Apple iPhone/Touch, Nokia Symbian, etc.) is also integrated. Exchange (no need to buy anything extra like a Blackberry server). Exchange provides the ecosystem you need to help manage your daily life all in one place from just about any web enable device. In addition it allows you to share email folders, calendars, contacts and task with other individuals using the same Exchange server. Exchange was designed for larger corporation but the little publicized Hosted Exchange program allows individuals and small businesses access to the same functionality enjoyed by larger corporation without the need to own servers or software licenses. Hosted Exchange services work well with the iPhone/iTouch 2.x software, although Apple has a ways to go to implement all of the Exchange ActiveSync functionality. I have been using 4smartsphone as my Hosted Exchange provider since 2005 and have been very satisfied with their service. My only complaint is that they do not provide the ability to create aliases or contacts that I could use as distribution lists for emails which need to be received by my wife and I. This meant that the domain names I had registered on GoDaddy needed to use GoDaddy's email system so I could create forwarding email aliases. The disadvantage of using this technique is that all emails are funneled through GoDaddy's servers before being delivered to 4smartphone's Exchange server. Not that this is a big deal but technically it adds another point of failure. An important item to note; If I had not wanted the alias forwarding functionality I could have created a DNS MX record on GoDaddy to point my email directly to 4smarthphone. This last weekend, I was renewing the subscription on one of my domains names when I noticed that GoDaddy was now offering Microsoft Hosted Exchange services (they sell it as Microsoft email). Since they provide the alias forwarding functionality on the vanilla email services, I thought they might do the same with the Exchange service. I found that they did, but was that enough for me to go through the pain of switching. When I checked out the pricing it, the decision became a no brainier. I currently pay $11.95 per month to 4smartphone per 500MB mailbox (I have 2, my wife and I). That totals to $286.80 per year for the both of us. GoDaddy is offering a 2GB mailbox with mobile access for $97.09 per year. For the the two of us that comes to $194.18, a savings of $92.62 per year. The yearly price is less than the $99 per year retail pricing of Apple's MobileMe which mimics much of basic Exchange functionality, but has been froth with problems. If you don't own Office 2007 with Outlook, another great feature included in the Hosted Exchange service is a license of Outlook 2007 or Entourage with each mailbox. One of the feature I use daily in the desktop version of Outlook is flags. Flags are very useful to highlight a message and add a reminder without having to create a task. I sort my inbox by flag, then by date received. This provides me with my flagged email at the top of my inbox view. 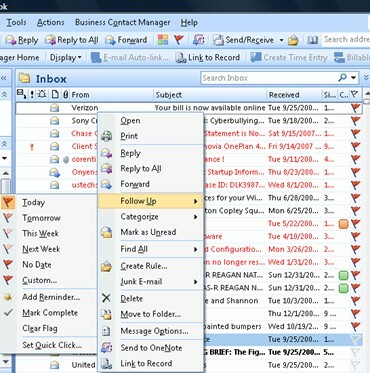 In Outlook 2003, flags and categories were linked together. Flags could have categories associated with them. This allowed you to categorize as well as highlight messages with one action. In Outlook 2007, the Office team decided to break out categories and flags. Categories are now separate from flags. From a view perspective this broke the way I sorted my messages, since categories are now sorted independently from flags. I have not been able to sort the messages in Outlook 2007 the way I had them in Outlook 2003. I have found categories to be very useful in the past but now that I can't sort them within flags I find that I don't use them as much. I do however use flags quite a bit and now with Windows Mobile 6 and Exchange 2007 we have the ability to use flags in Mobile Outlook. A tap on a message displays the menu with the flag options. The only missing feature in Windows Mobile 6 is the ability to set an associated reminder on the message. Also message flag reminders are not synced to Windows Mobile 6. Hopefully, the next version of Windows Mobile will provide these features. This weekend I migrated over from 4smartphone.com Hosted Exchange 2003 server to their new Hosted Exchange 2007 server environment. The process was fairly painless. If you have not upgrade to Outlook 2007, I recommend you do so. I am now running against Exchange 2007, everything seems to be running fine however some of my rules don't seem to be executing on the server. The mail comes through on Windows Mobile before it gets to the rule. I am researching the problem. The ability to wipe my Windows Mobile 6 device from OWA in case the unthinkable happens. Searching my entire mailbox from my Windows Mobile 6 device since I only store 1 week of data. Setting follow up flags from my Windows Mobile 6 device (this is limited compared to Outlook but helpful). HTML mail on my Windows Mobile 6 device. I played around with MusicBridge this weekend with no luck. Unfortunately, this along with my DFL-210 router VPN setup will have to go on the back burner for now. As I mentioned in this post, Ilium Software has just released ListPro 5.0. I have never used it and will start playing with it for a pocketnow.com review early next month. I need to look at how to best share pictures with Kodak's EasyShare web site with family and friends on my upcoming vacation (I am not taking my laptop). They now all have EasyShare accounts making their access simple. Apple resolved the iTunes backup function problem (unable to write to DVD) with version 7.3.2; it only took about a month...I installed MusicBridge to transfer my iTunes library to Windows Media Player (WMP), however I was unable to view the library in WMP. I have a feeling that the problem has to do with the location of the library; I did not have time to look into it further, but hopefully will have time to play around with it this week. As I was working with MusicBridge I also upgraded the Microsoft Bluetooth software and paired my Motorola HT820 Bluetooth headphones. They work well with Vista. Every time I rebuild my Pocket PC environment, my device always seems faster. My Wing is no exception...I finally got around to installing Gougelet PE XnView Pocket version 1.40 photo editing application and RandyRants.com Pocket SharpMT version 3.3 blogging application. They both work fine with Windows Mobile 6. I also upgraded Omega One 1-Calc to version 3.2.3, the calculator's performance is greatly improved over version 2. I also installed Pocket Informant 2007 R4 on the storage card with no problem, which enables me to have 11.5MB of free Storage Memory. I use Zagat's To Go Windows Mobile application to find restaurants when I travel, Visa has teamed up with them to offer a free 1 year subscription. You can register for a limited time here. With today's mobile application standards (phone access and mapping), the application is so so, but the review content is excellent. 4smartphone.com, my Hosted Exchange provider is slowly rolling out its Exchange 2007 migration instructions to existing Exchange 2003 customers. I have not received mine, hopefully this week. Their plan is to get everyone migrated during the month of August. I will finish my review of the Sunny solar charger. I will continue working on setting up my DFL-210 as a VPN server. I will continue to work with MusicBridge and try to resolve the issues I am having. It looks like the press is starting to notice T-Mobile's [email protected] service. All are very complimentary about the technology, the only issue is the lack of choice in handsets. There are also rumors floating around about HTC testing a client for our Windows Mobile devices. Hopefully they can release a client in the near future. The Samsung SGH-T739 UMA phone was approved by the FCC July 13th and it looks like it will be sold by T-Mobile (hopefully soon). On my front, so far so good, T-Mobile [email protected] service is working very well. Last week Apple announced that is had sold 270,000 iPhone and accessories (what a crock), while AT&T only reported 146,000 activations. The activation number is probably closer to the real number of iPhones sold with close to 1 accessory per sale. The numbers make total sense when you look at the accessory market for the iPod. Apple is still touting the 1 Million mark by the end of the year, with accessories I would say that it is achievable, without them I don't see it. They don't need their phone to be a music player. They want their phone to have voice and text messaging, that's it. 4smartphone.com, my Hosted Exchange provider is rolling out Exchange 2007 for new accounts and will be providing a migration path in the next couple of weeks for Exchange 2003 users like myself. I have been with them for 19 months and very happy with the service (only 2 outages), I love having ActiveSync server which automatically syncs my contacts, tasks and calendar to and from my T-Mobile Wing. It is great to have the information propagated without having to think of where you entered it (Outlook, Outlook Web Access, or Pocket Informant/Pocket Breeze on my Wing). And with Exchange 2007 I will be able to view HTML email on my Wing along with the additional security of being able to wipe my device should I loose it. I can't wait. I continue to work on a review of the Sunny solar charger. Back in March I started using Callwave's free voice mail service. At first I was a little dubious about its value, however I have to say that it has been very useful. I now have only one voice mail box for my Sunrocket VOIP and T-Mobile cellphone numbers. I use the Sunrocket Find Me forwarding to my cell phone, then on no answer or reject, it forwards to the Callwave mailbox (It does use my T-Mobile forwarding 1000 minute pool). When I miss a call, I receive an email with the caller id name (if available) and number information in the subject line. I receive an email whether the caller leaves a message or not. If the the caller leaves a message, I have chosen to have the associated .wav file attached. Last week Callwave announced a new feature which translates the voice mail message to text. The email now contains the translated text and it works pretty well. I use 4smartphone's Exchange ActiveSync on my T-Mobile Wing. I set the Windows Mobile inbox options to not automatically download attachments. I no longer have to download the .wav attachment to hear the voice mail message, I can read it...and up to now I can make sense of the text without listening to the voice mail. This is pretty cool and it is free. Callwave also has two Vista gadgets, one which displays missed calls and allows you to playback messages, and one which allows you to send SMS text messages (free to the sender, the receiver still has to pay or have a text message plan). This makes the iPhone Visual voice mail a little behind the times...Hopefully it will stay free. Yesterday, I was able to purchase a T-Mobile Wing. None of the phones on our Family Plan was older than 24 months, my MDA is 14 months old, so I had to pay $349 with a new 24 month contract. If you are over your contract term you can purchase the Wing for $299 with a 24 month contract. So far I am very pleased with how it feels and right off I was very happy with the full length stylus. Two hardware problems which have plagued the MDA were the stylus holder and the mini USB connector have been redesigned. Even though the stylus holds in place in my MDA it is a little loose and on occasion have fallen out (I lost 2 stylus that way). I never had a problem with the mini USB connector but I know people who had issues with it. The Wing's stylus holder is setup like most PDA with a full length stylus which fits tightly into the case. They placed a cover on the mini USB connector to protect it. I am not sure this will solve the problem since the cover will probably break off at some point. I was able to easily synchronize with Windows Vista's Mobile Center via Bluetooth. The setup for my 4smartphone Exchange email account was a breeze. I have grown very fond of one handed operation with my MDA using Smarstkey. It looks HTC and Microsoft have learned some lessons from Smarskey and they have reorganized the buttons on the device. Now I need to learn the new scheme, but so far I like it. The MDA on the right has 2 buttons at the top (default to Mail and Pocket Explorer), 4 buttons at the bottom (call/answer and right/left soft keys), and the D-PAD. I used Smartskey on the MDA which allowed the use of the right/left soft keys to bring up the start menu and force the closure of programs. The Wing on the left has all the buttons at the bottom. HTC has replaced the Mail and Pocket Explorer buttons with a start menu button (below the call button) and an OK button (below the call end button) which can be configured to force the closure of well behaved applications (new Windows Mobile 6 feature). The buttons on the Wing are smaller and cramped together, however I am getting used to them with my fat fingers. On the left side, the top button on the Wing is for Camera while the MDA was for the Comm Manager/Vibrate mode. The slider was placed lower on the Wing. The reset switch pin hole is right below the slider. The Micro SD slot on the Wing is below the reset switch pin hole. I like the cover, however I hate having to buy one more flash card format. I feel like I have a become a forced flash card collector...what a racket, although the prices have dropped significantly. The right side of the Wing has two buttons. One defaulted to voice dialing/voice note, the other to Mail. I am glad they have a button for Mail, I still have to figure what to do about the Pocket Explorer button, I got use it to on the MDA. The MDA has the voice dialing/voice note button and camera button. In the middle of the MDA is the infrared port which is a feature that is missing from the Wing. I think I used the infrared feature once on my MDA so I am not sure I will miss it. It seems Bluetooth is becoming the standard for inter device communication. The top of the Wing has the power button the left while the MDA had it on the right. This is taking a little time to get used to. The MDA has the mini SD slot on top. The bottom of the Wing has the mini USB connector protected by a cover. The mini USB connector is used for headphone, charging and data connections. The MDA has an mini plug for headphone connectivity and a switch to pop the back cover off. This picture shows the lanyard hooks on both devices. Lanyards are not included in the package T-Mobile sells. I am not sure I like not having a dedicated headphone, however someone should be producing an adapter which will work with standard headphone jacks. The backs are quite different. Both have external antenna connectors up in the upper left hand corner. The Wing's back cover slides off. The cameras are in different locations. I like the side location on the Wing which makes it less prone to be covered by my big hand when I hold it. The styli on each unit. I really like having the full size Stylus. Hopefully someone will produce one with a pen which I have found very useful on my Dell X51v replacement stylus. So far my experience is very positive, I like the feel although it seems a little heavier (I will have to weight both of them). The Bluetooth sound quality seems much better.